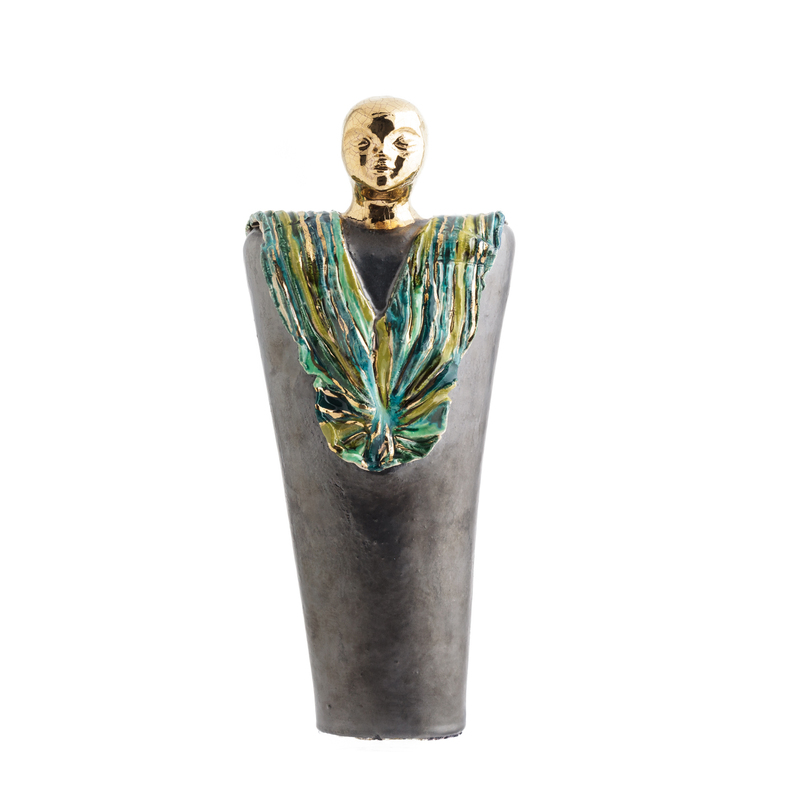 This piece of art is part of a major collection crafted by the artist, inspired by the ex voto charms found in Punic tombs. Originally designed as monochromatic pieces, they are now enriched with reliefs, many-coloured glazes, pure gold and shells. 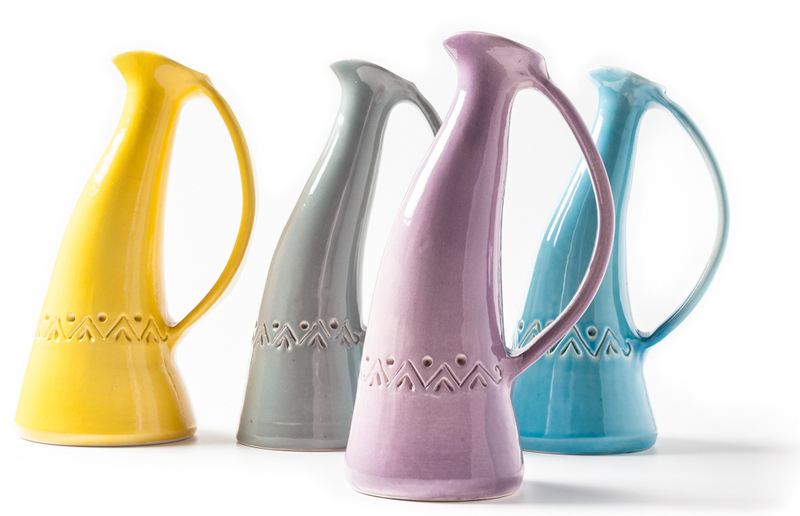 Hand-crafted and decorated glazed ceramic many-coloured jugs. Lathe-crafted and then bent in a dynamic shape, counter-balanced by the handle. Featuring bright monochromatic decorations, the pieces show the marks of the craftsman's work, enriching them in a unique way. Su boe, the bull, is the symbol of strength and vitality. 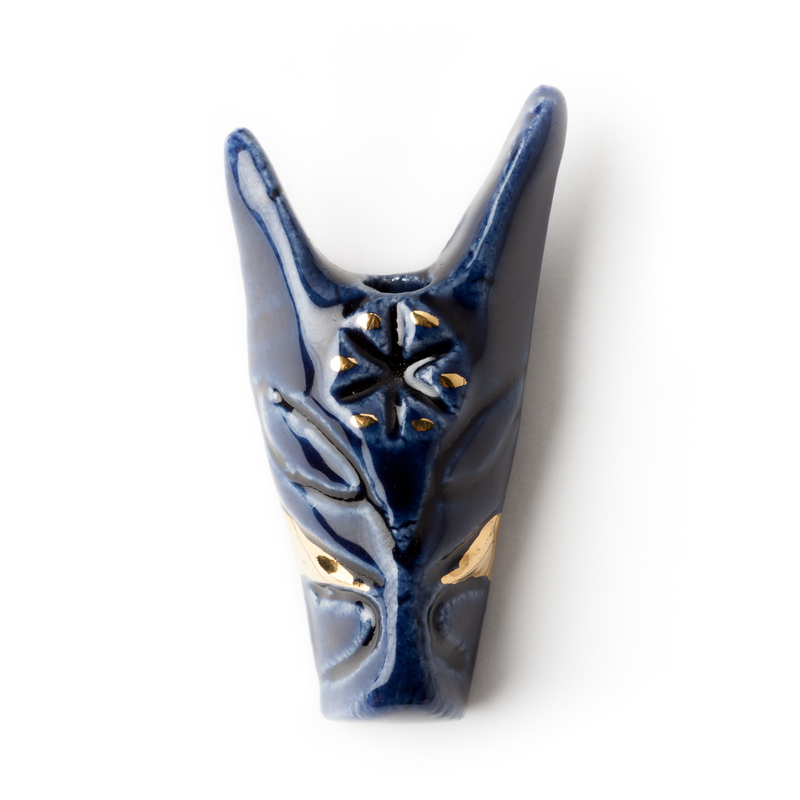 It is included in the design of the precious glazed ceramic pendant, finely hand-crafted and decorated. 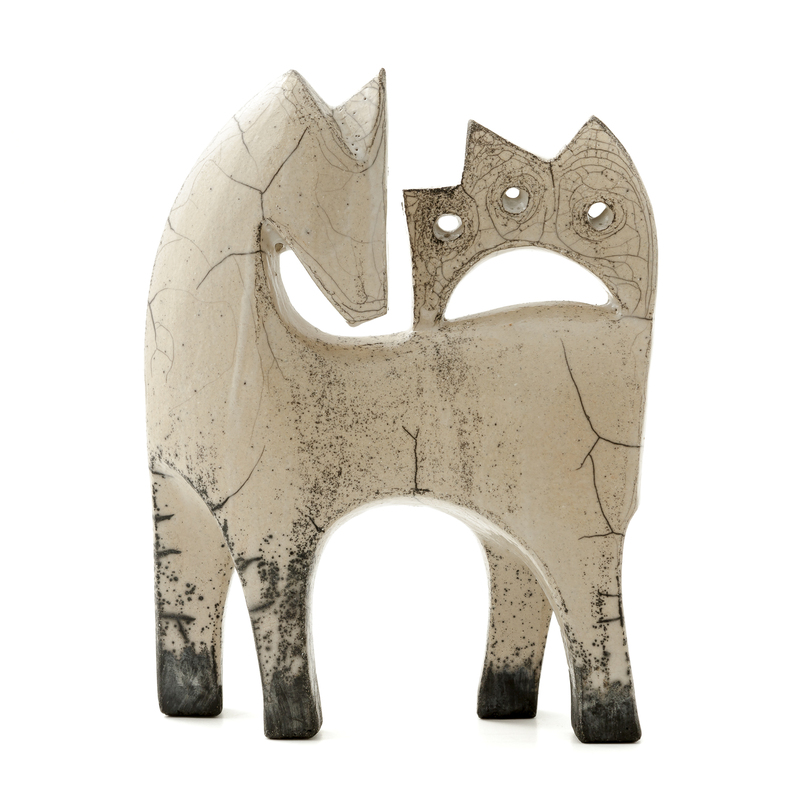 The figure of the little horse is tastefully depicted in a sensitive plastic pose in this raku ceramic sculpture featuring fine chromatic effects. 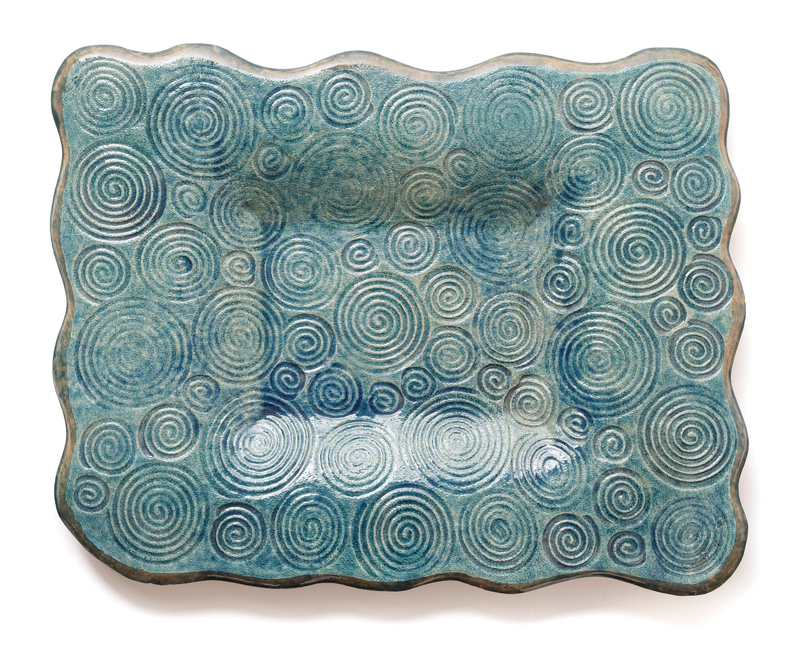 The combination of a number of spirals makes up the decoration of the precious ceramic plate, characterized by sinuous irregular shapes and the glazed surface of vibrated blue color. Handcrafted, it is the result of a creative path that determines its uniqueness. Local pottery production started during the Neolithic age, featuring peculiar characteristics that evolved during the Nuragic age. Neolithic pottery productions explored the female body, rounded also in pottery production, being a representation of the Mother goddess. Nuragic pottery featured simple and stylized designs, a tribute to the strength of war. In the following ages, the regular exchange of imported pottery, linked to the interaction of different cultures with Sardinia, made it difficult to define what local production really was, since production became a self-sufficient expression of modern age, only when stylistic features and technical procedures were define and kept unchanged until recent times. For instance, terracotta was slipped and glazed. Few and functional models were lathe-crafted: pitchers, marigas, containers, sciveddas, pans, pingiadas, flasks, frascus, bowls, discus, and other types of pots and pouring receptacles. The setting is rural and pastoral. They are objects of daily use, for the transportation and and storage of water, baking, the preparation of desserts and food products. Yet, embellishments and expressive characterizations are also used. The festive versions are used during solemn occasions, anniversaries, rituals, and are part of the set of votive tools. They are made by the most skilled figuli, using graphite and decorated with plastic additions, plant motifs and the figures of saints and other religious and good-luck symbols. These productions that belong to the local material culture, together with the productions of other sectors such as hand-made weaving, jewelry, carving and basket weaving, share a secret language, and intimate and evocative jargon.